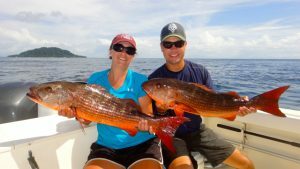 Offshore fishing with Come Fish Panama this week was a very nice couple consisting of Kyle and Sarah from South Carolina. 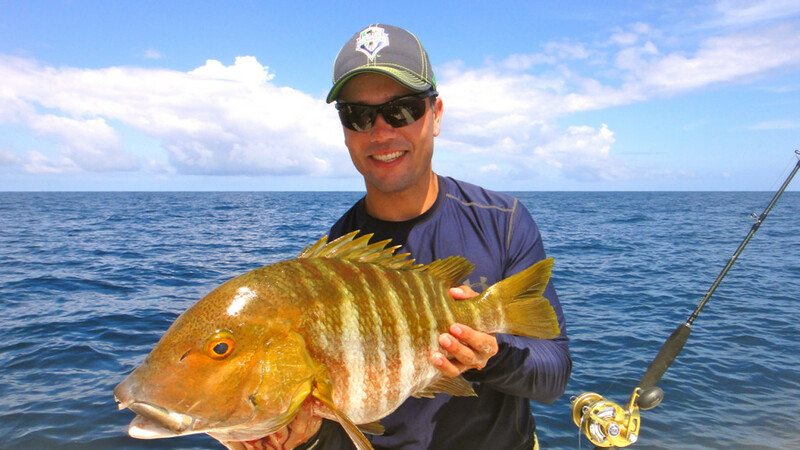 Kyle, a seasoned angler, was excited about the possibility of hooking a Marlin and Roosterfish on this trip. 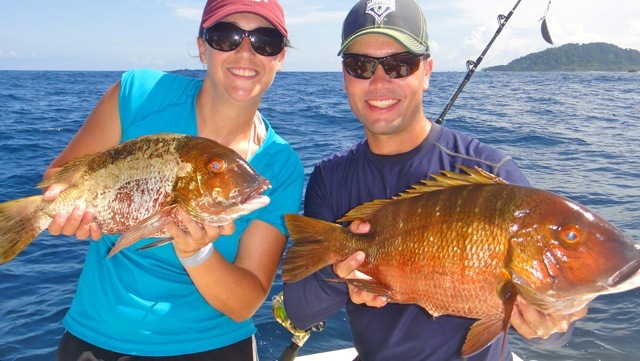 On the other hand, this was Sarah’s first time offshore fishing. We were happy to have them both on board the “Sweet Leilani”. This week the wind was light, the currents good, but the water clarity inshore was bad with a red tide, a phenomenon caused by an algae bloom. Heading offshore the conditions improved dramatically and we finally came upon nice blue water. We could only hope that the water conditions improved inshore soon so that we could get that Roosterfish Kyle was after. our Bonito as bait for the slow troll over the ledge. 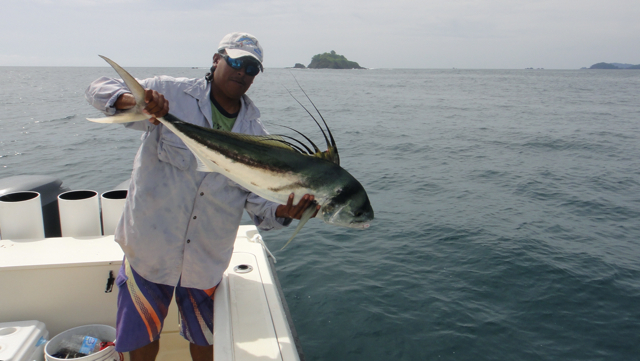 The most widely used method for fishing Marlin in Panama is slow trolling a live, bridled Bonito or small Tuna. 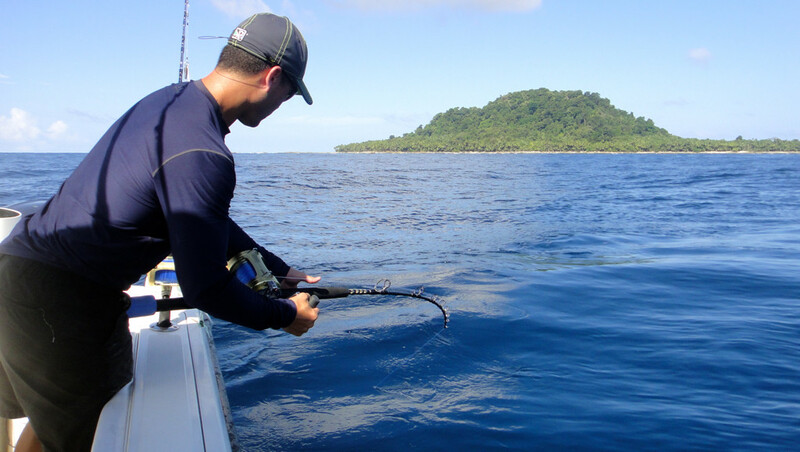 With the baits out, the wait game began to see if a Marlin would show up. And show up it did! We had a three-bait spread consisting of two Bonito and a Blue Runner on the short line. All three baits were acting pretty nervous and we were ready and tense with anticipation. 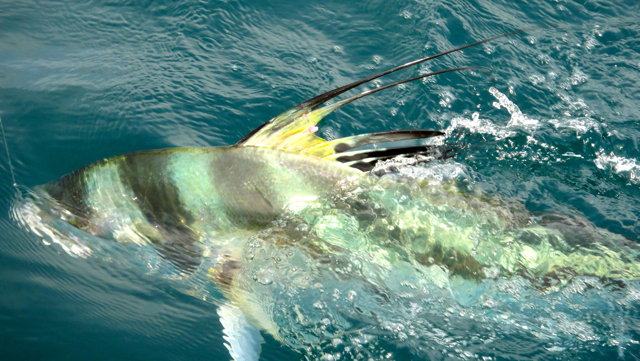 Time slowly drifted by, when all of a sudden we all saw a Marlin on the surface checking out our offering. The Marlin popped up to check out the scene and just like that, it was gone, never to be seen again. We did our best to hook Kyle up with his Marlin, but unfortunately it wasn’t going to be on the first of this 3-day trip. 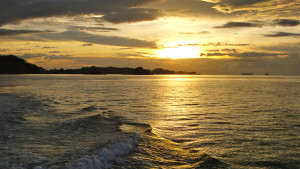 Heading offshore, we set a course straight to Isla Montuosa with the hopes of raising another Marlin. Soon after getting our Bonito bait and setting up on the Marlin ledge, we started to have a fuel system problem. The primer bulb on one engine kept loosing pressure, starving the engine of the required fuel flow. We decided it was best to head back to the lodge and take care of the problem instead of risking being stranded 40 miles offshore. As we were slowly making our way back on one engine, we worked on the problem and within 20 minutes we had good fuel flow and the second engine back online. Determined to have a mechanic look at the problem, we continued to head back to our home port, but after an hour ride in smooth seas, the problem seemed to be fixed. As we approached Isla Paridas, the water clarity was significantly better than the day before so I asked Kyle and Sarah if they wanted to try their luck with a Roosterfish. They were pleased with the suggestion so out went the Blue Runners on slow troll and within 15 min or so, Mr. Rooster was hooked up and Kyle in on the fight. 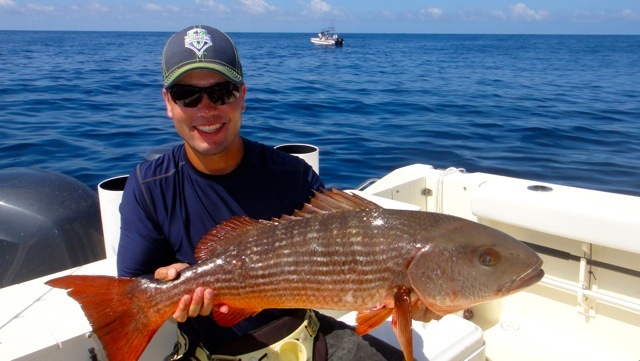 After some rod-bending action and a couple of typical Roosterfish runs, Kyle had his beautiful fish boat side. Out came the camera, of course! Once the photo session was done we safely released his Rooster. I suppose Kyle can now check that one off his fishing “bucket list”. We tossed out a couple more Blue Runners and within 5 minutes, Sarah was hooked up. Once color appeared we notice she had a nice-sized Pacific Crevalle on the end of her line. Way to go, Sarah! Bull Dorado which gave her a great fight while Kyle filmed the action. The grim on her face during the fight instantly turned to all smiles once the Dorado was boated. 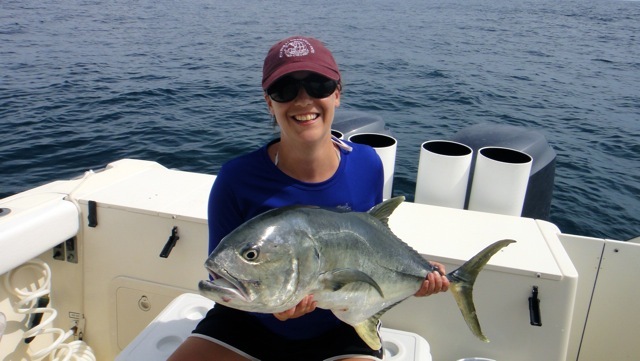 For a novice, Sarah handled that fish like a pro. And of course, the proof was in the picture. We then decided to look for some awesome bottom fishing action that would have both of them with bent rods the rest of the day. 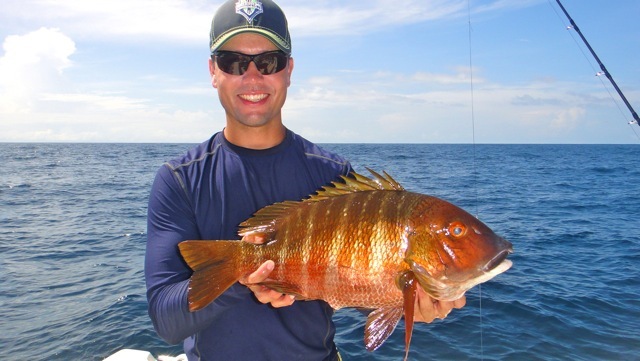 Many Species were caught which included Mexican Barred Snapper also known here as Rock Snapper, Jack Crevalle, and Mullet Snapper. These are pretty tough fighters, so this young couple was probably a bit sore at the end. Both of them did an excellent job. Congratulations. 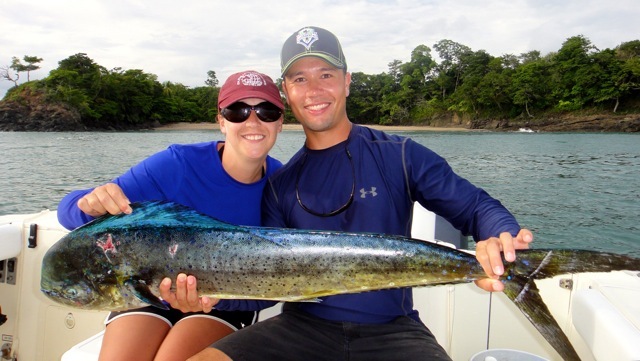 Our Thanks We would like to thank this wonderful couple for having trusted Come Fish Panama with their business. 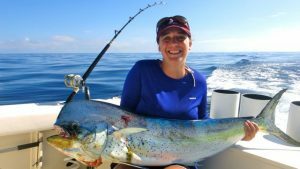 As a small token of our appreciation and as a way of apologizing to them for our mechanical problems, we offered Kyle and Sarah 2 free days of offshore fishing in 2014. 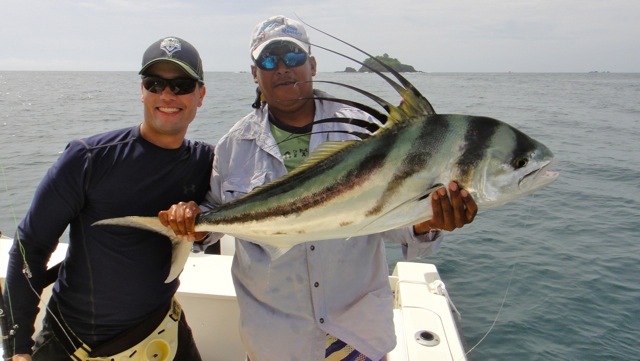 Hopefully they will have the opportunity to make it back to Panama during the Marlin bite, or better yet, the Yellowfin Tuna bite. We look forward to seeing them in the future and wish them the very best!